"Where are you coming from Uche at this time? I hope you know that your children are seeing everything you do". The next thing that landed on Linda's face was a slap and she found herself on the floor. She began to cry and her mind began to flash back at all the warnings she got from her parents and friends. She even fought with some of her friends because of him. Linda wished she could turn back the hands of time, if she had another opportunity she would never have married Uche. 1. If you had another opportunity would you marry your husband or wife again? 2. If you could turn back the hands of time would you thank God for the day you met your husband or wife? 3. Do you want your children to be like your husband or wife? 3. If you had the chance would you leave your marriage? Think of these questions for yourself and also think of how your spouse will answer. That will let you know where both of you stand. If you love him or her you need to sit down and try to make things right. Examine yourselves! 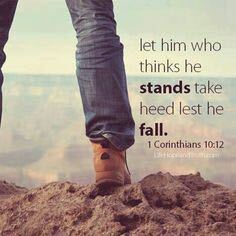 1 Corinthians 10:12 (NLT) says If you think you are standing strong, be careful not to fall.